Are we living in a Christian country? Certainly, Christianity is the largest religious group in Australia: It influences our language, our culture, even our law… It underpins our social ideologies, and is the backbone of the largest school system after the state system. But where is the Church situated in the mind of modern Australia? Is ‘Christian’ really an appropriate description for our culture? 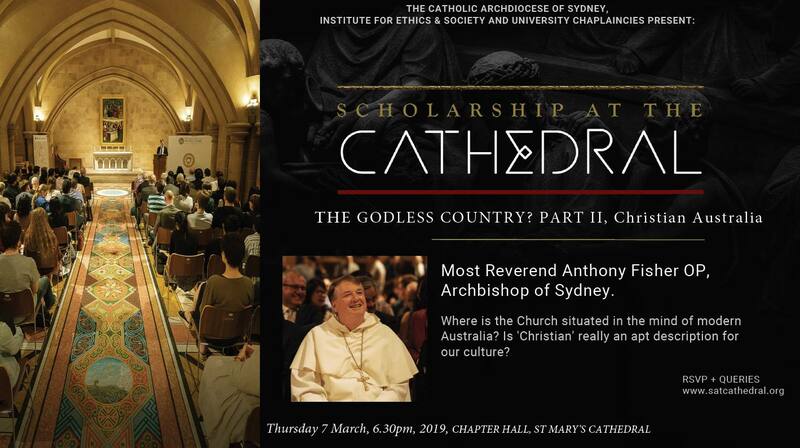 Please join us as the Archbishop of Sydney delivers his second installment of “The Godless Country? Part II, Christian Australia”. Scholarship at the Cathedral is an initiative of the Sydney Archdiocese in partnership with The Institute for Ethics and Society of The University of Notre Dame Australia. In 2019, a series of public lectures with eminent intellectuals, both Australian and international will take place at St Mary’s Cathedral. This event is sponsored by Most Reverend Anthony Fisher OP.